In an effort to be affiliated to a new project at the university, dealing with the in vitro propagation of endangered plants from the foothills of Himalaya, I found it necessarily to make a expedition to Nepal, Bangladesh and Bhutan which are connected by the Indian province West Bengal. While I'm here, I might as well enjoy the vivid culture and with luck; some of the nature. Especially Lloyd's Botanical Garden should have some amassing collections of the areas botany. 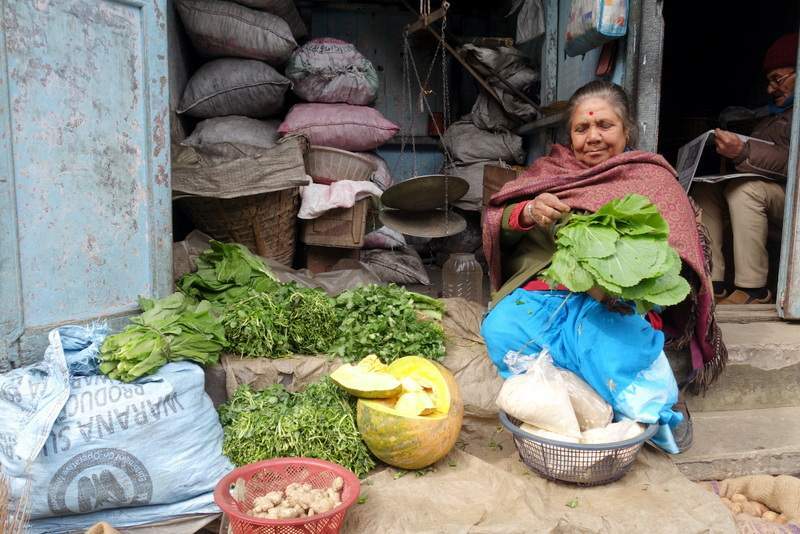 I have arranged several visits to nurseries along the road, however, India is just considered as a way to connect the other countries on this expedition. 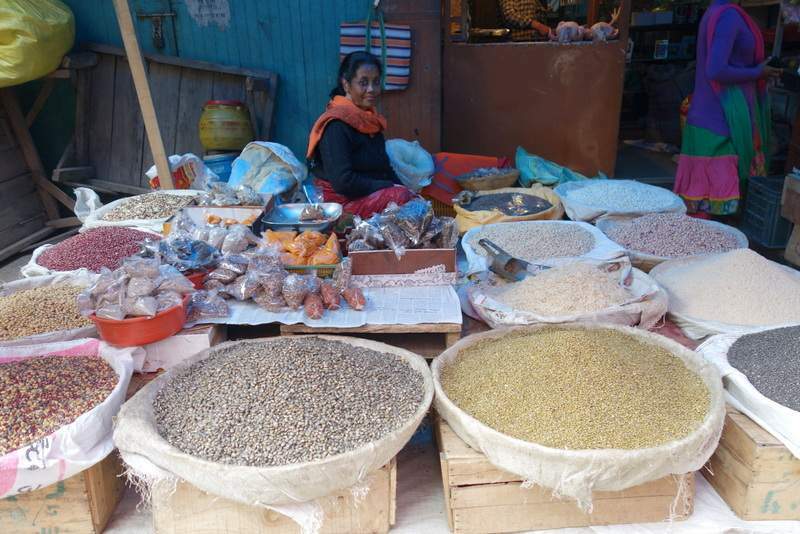 I have been in northern India before, but not this far north-east, and is truly different! 28/1. Against all odds, I actually cross the border from Bangladesh only two days delayed, at exactly noon. It is just a short walk across a railroad, but the bureaucracy is considerable. I pass through six counters, each in its little house or hut, I get my backpack x-rayed and looked through. Several interviews and filling out forms with exactly the same information, while the officers do the same, based on the information on my passport. Picture taken once again, four stamps in the passport, signed by other officers and finally, I'm let out to roam free in India. Well, twice, the bus is stopped by some military personnel, one wanting to see my passport. I trishaw to the bus terminal cost 20 Rupee, and he need help to get the last 10R! I get a ticket to Balurghat, not on the list of ten names I have for waypoints to Darjeeling, but several agree; that is where I want to go. Every thing look just like Bangladesh, and I having a hard time finding anything to make a photo of. 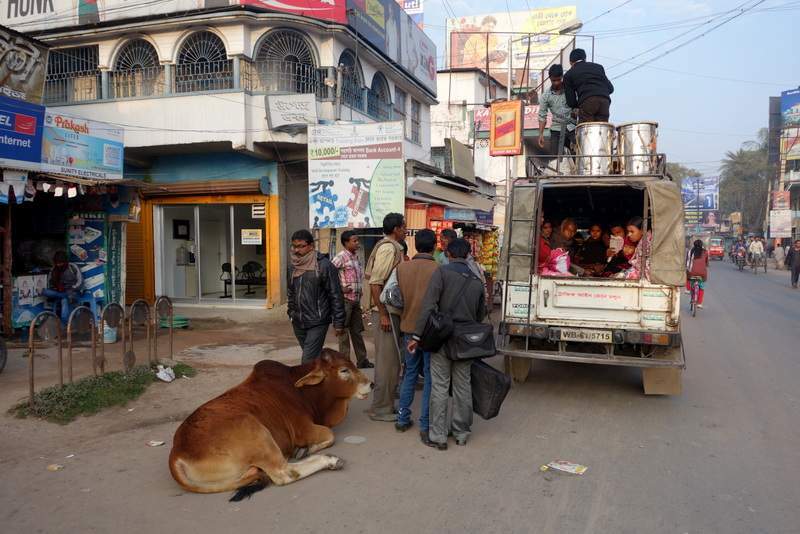 Well, here are significantly more cows in the streets, and not in front of the butcher shops. Here are also female soldiers, police and shop keepers and no covered women. Someone tells me, I can get an express bus from here, to the major city Siligure, but at nine in the evening. I was aiming for Siliguri, but I had feared I had to do the nine transfers. 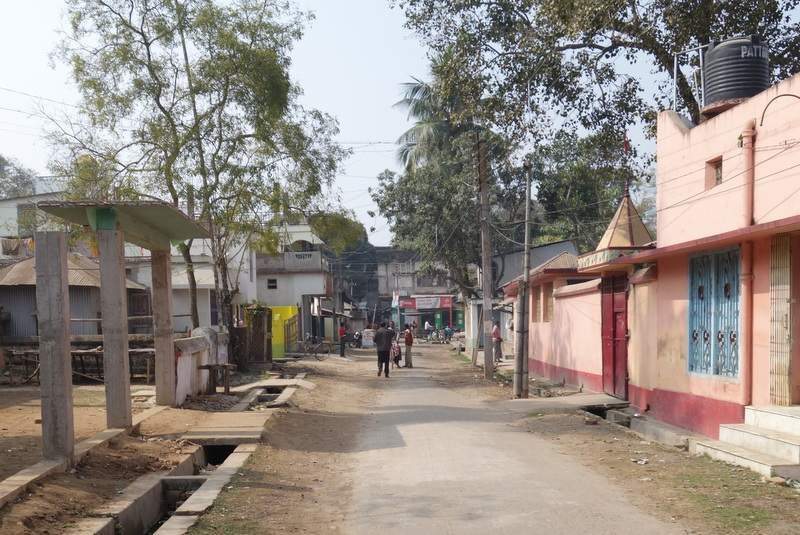 I rather spend the day in Balurghat and then 10-11 hours on a express bus during the night. Else, I recon, it will take me two days during the day times with transfers. I arrival in Balurghat around two, and shortly after, I have a ticket for Siliguri in the evening. The sun just broke through at the border, but now, the clouds are pulling together. The bus is at 20;00, but I decide to treat my self with a hotel anyway: Logen Lila. 350R, and I have a nice room with bath, just next to the bus terminal. A quick and expensive meal at a little joint; 150R - €2, but is is a great gravy with mutton and fried rice. I had a feeling of, the time might need adjustment, and it is half a hour earlier here. Back to the hotel to have a short nap before I start working. Of cause, the SIM modem I used in Bangladesh is not working, and I'll wait an see, if the hotels will have before buying a new. Neither of the two internet stores in the ground level of the hotel has Wi-Fi, and I didn't bother to bring my Thunderbolt-juggle. The sun have returned, and I go for a stroll in the city. It seems like I already can the most essential Indian: Dub-tar. The main street is not that busy, but the shops are just like those in Bangladesh. I cruises around till I stumble over the marked. 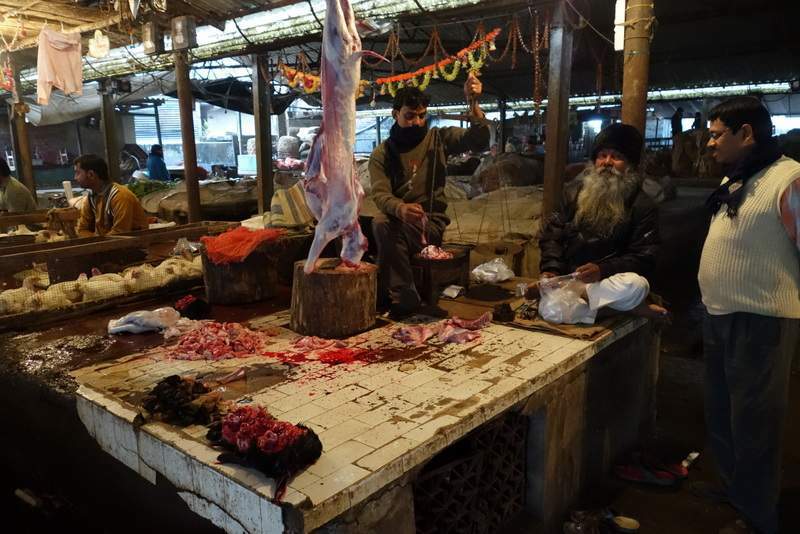 Here are rice en-gross, butchers of goats and chickens, fishmongers and even a line of fish auctions - with little customers. One shop sell charcoal, another firewood. 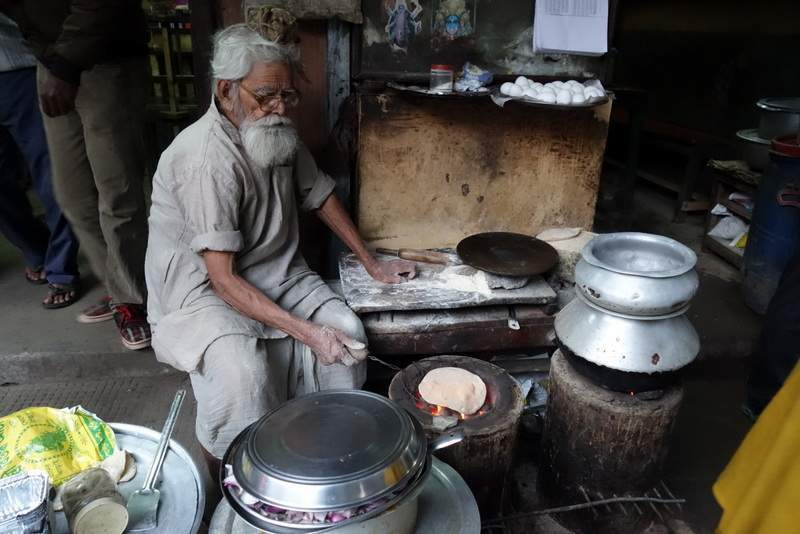 One of the tea shops use egg-trays as holy smoke. Could be worse, I guess. In one place, a huge number of people are gathered to some Hindi religious thing, in another, a bunch of people are playing some real good music. At six, it darkens, and I head back to my room, armed with water and biscuits for the evening in the bus. I am fare from looking forward to this nightly ride, but it is my best chance to catch up some of the lost time. I got the very last seat, right in the bumpy back of the bus - could not be worse, I think. Well, no seat and no bus of cause. After Bangladesh, I easy to please. I work until is time to find the bus - fighting the desire to grab yet another nap. Especially the trick: How to find three days in an already tight schedule, causes some problems. Two lost by the bouncing at the borders, one due to the fact I'm 400 kilometres south of where I wanted to be. I dress in warmer cloths. 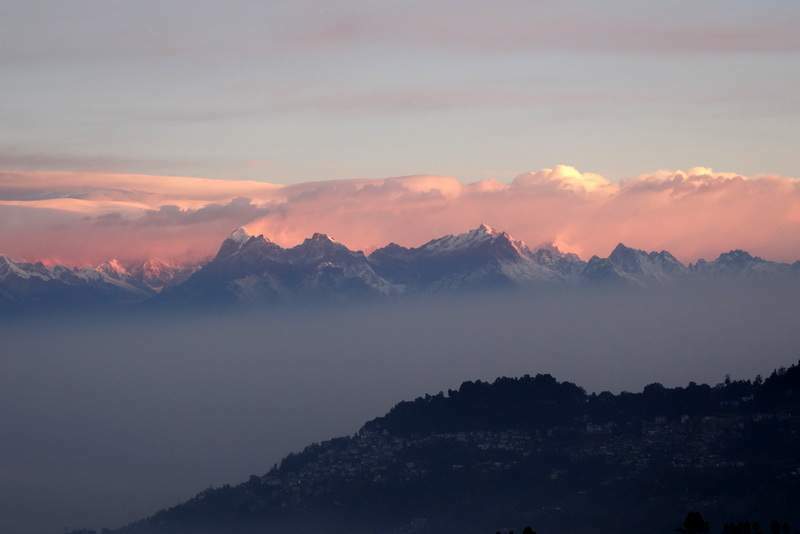 The weather forecast has predicted 13-15C in Darjeeling during the day, but the present temperature now show -2C. I guess the "-" is an error - sure hope it! But is can easily reach frost at night, I have heard. I'm at the terminal in good time for a dub-tar, and a friendly man show me to the bus. On the way, someone calls me, and it turns up I am leaving a trail of bags, falling out my bagpack's broken zipper. I walk bag, and get what I can find, hoping the essentials are there - well all is essentials in my bag! We are all here, and the bus leave early. We pick some up along the line, and make a eating stop around midnight. I manages to doze off sometimes, but some bumps throw us out of the seat. The more smooth stretches feel like one wheel is oval, the other square. 29/1 At four, we make another stop, and most of the bus empties. The guy next to me tells me: It is Siliguri! Outside, I hear someone calling Jarjeeling, and it is a pretty packed 4WD'er. He ask for 130R for the 80 kilometre tour, but a newspaper distributor marches that with a empty car. We must be at the outskirts of Siliguri, and pretty fast, we are on the main road. We make a turn through a huge military camp, then a moor with intense fog. Here are several signs warning about elephants, but i don't see any. Then the fog clears, and we start climbing a lot for the next 50 kilometres or more. 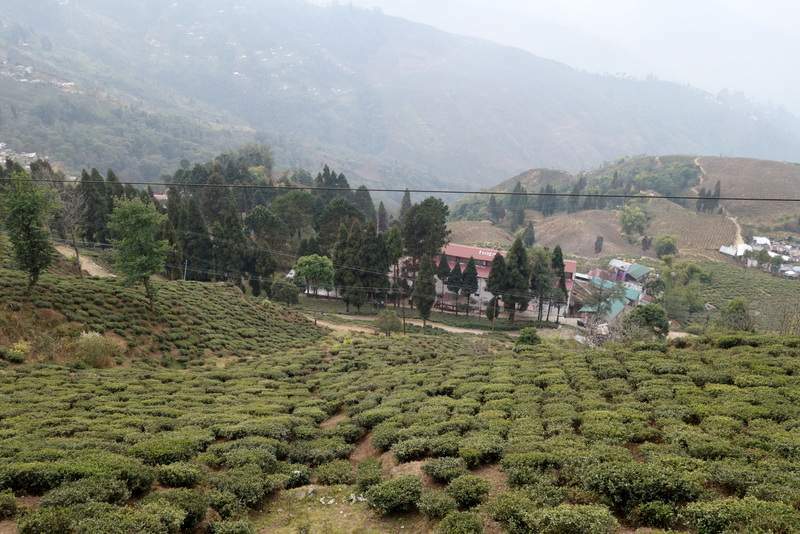 Through tiny villages and tea plantations. We follow a narrow gage railroad track, crossing it time and time again. At six, it starts to lighten, and I can see the tiny houses in the villages are cosy, little wooden houses. Here is frosting on the roadside, and it clearly get colder as we assent. The few trucks we meet are brand new, and not the usual Indian style. Just before Darjeeling (elev. 2135), the sun breaks through, and the most amassing mountain range reveals itself. I pay an additionally 20R to get to the hotel, but is is quite a walk uphill through the town. I passes at least 30 other hotels, and when I finally find "mine", it is closed. I can hear someone inside, but they don't reply to my calls. On the other side of the road, a cosy little wooden house offers room too, and I pay 300R for simple room with a breath taking view to the sunrise. My plan was to go to Tigers Hill, 10 kilometres out to enjoy the view to Everest and the other peaks, but the shared Jeep only leave before four in the night. And I'm not going to do that to morrow morning! In stead, I work a bit, than try to get some breakfast until the Lloyd's Botanical Garden opens at eight, while the hotel will take care of my laundry. It is a rather long walk down to the town, and out to the garden. The gate reminds me most of all of prison entrance, and the first part of the walk the same. The thing changes, despite the misty and cold weather. It is a Large botanical garden with 16 hectares. It was funded in 1878, and some of the original plants are still here. The altitude of 1800 meters give a special climate, and this is Himalayan flora. 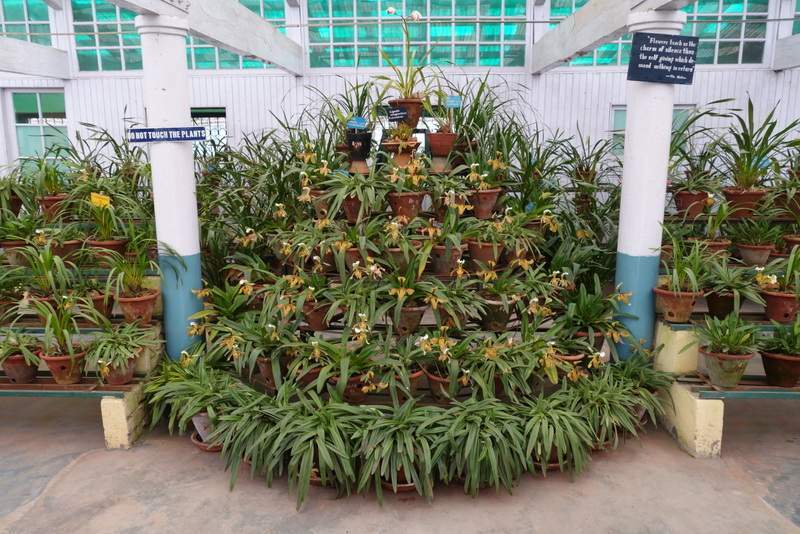 Here are 167 species of trees, 176 shrubs, 144 herbs, 80 orchids and 42 species of cacti and succulents. 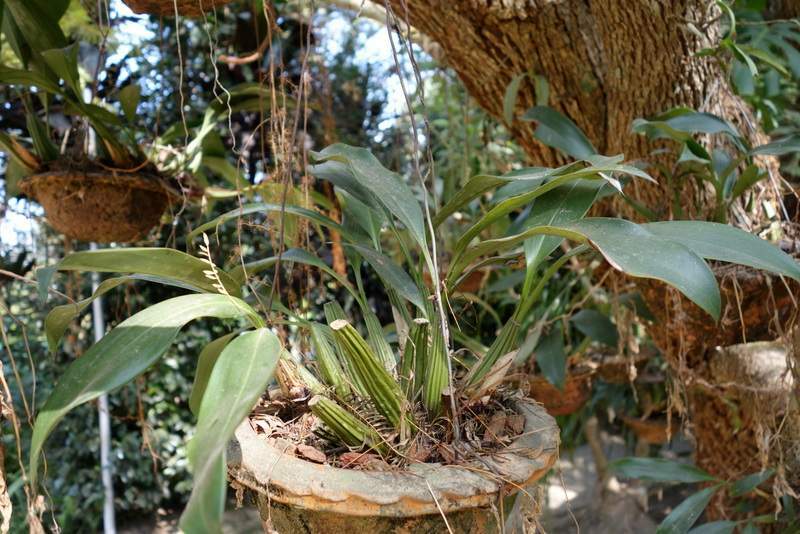 The many old trees is covered in orchids and other epiphytes as well as mosses. Besides from the living collection, the herbarium houses 14252 sheets from 175 families. The library 1000 books, some I noticed was first editions of Hookers work. The garden it self is keep perfect. There are not a "forgotten" corner to be found, and most plants have name tags on. 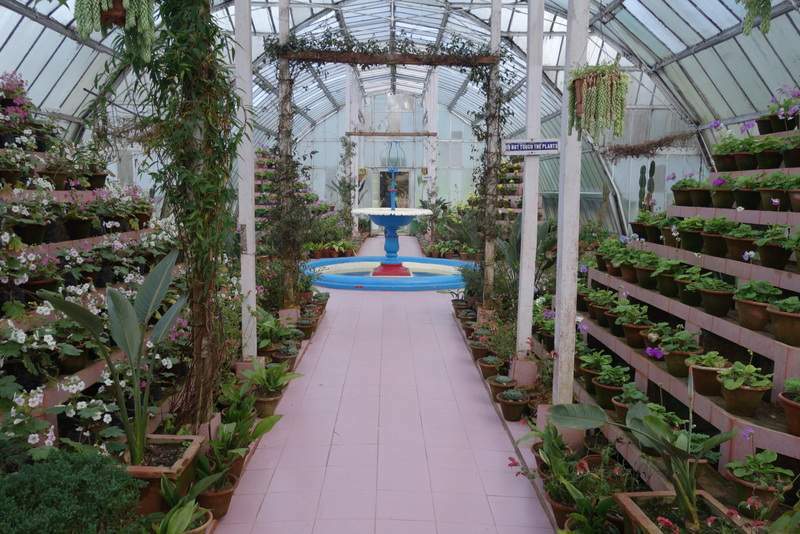 Here is a big conservatory, a cacti and succulent house and several orchid houses. Unfortunately, I'm here on a misty winter day, but I still find the garden fantastic. The orchid houses are, like the other houses, spotless. In the trees, I find an caudiciform epiphyte I a bit puzzled over. To clarify its identification, I seek out the Ranger Officer. It is the very present and well educated Mr. Manoj Kr. Chhetri, FR. We have a long talk about plants, botanical gardens, funding and alike. He tell me the plant I have found is Name pending. It fare from look like any Stephania I know, but Agapetes serpens does neither look like any other Ericaceae. I know. Here are a lot of them too. The visit end at the Orchidarium, which have a great collection, taken care of by an old gardener and his apprentice, given five years to learn the trade. The sun refuses to break through for more than a few minutes at the time, and I give up, getting some real good photos. I head down through the surprisingly little town. I would have thought 120.000 citizens would require more of everything. The only thing here are in abundance is Jeeps and cookie shops. The centre is packed with both. The central part is real worn down, here are no paint to be found. I had expected a fancy and rich tea- and tourist city - it look fare from like that. Further more, most shops are closed, so are the big marked. 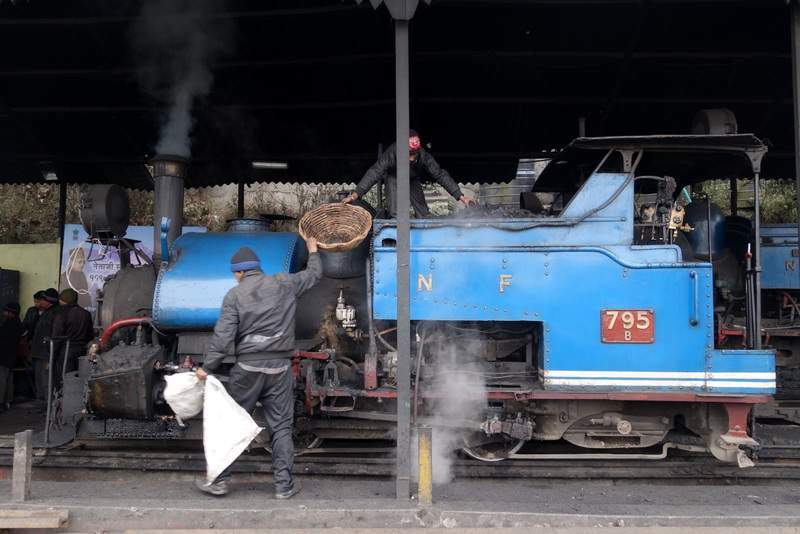 I do some loops, and end out at the Darjeeling Himalayan Railroad or the Toy Train: A UNESCO World Heritage. I have a look at some of the cold fired locomotives, but can't be bothered to wait two hours for a two hour tour. Instead, I head back to the other end of town again, to see the ZOO. It should be a real treat with several interesting breading programs and rare animals fro the Himalayas. It is a real long walk out there, and I have a bit hard accepting the sigh: Closed on Thursdays. It is still misty and cold (yesterday was great, they tell me), and I have nothing else to do here. I figure I can save half a day, heading on to Kalimpong. I feel a bit stupid, checking out of yet another hotel without sleeping in it, but time is precious. It is a bit hard to relocate the hotel again. On the map, it seems like it is close to centre, but the almost vertical mountain side means it is about 500 meters higher and several kilometres to walk. I pack my stuff, wait for the laundry man's son to return my washed but very wet cloth, and start the climb down to the motor-stand. I ask around twelve times, and are guided out to the other end, down some blind stairs, and round in circles. The mountainside is kind of upper site Ts, unconnected. When I pass my hotel again, I figure they can do some use for the 300R I have paid them. I finally reach the central part of town and the hundred Jeeps. The one on the upper square guards me to the lover, which sends me back. I feel like this city is either populated with morons and arseholes. 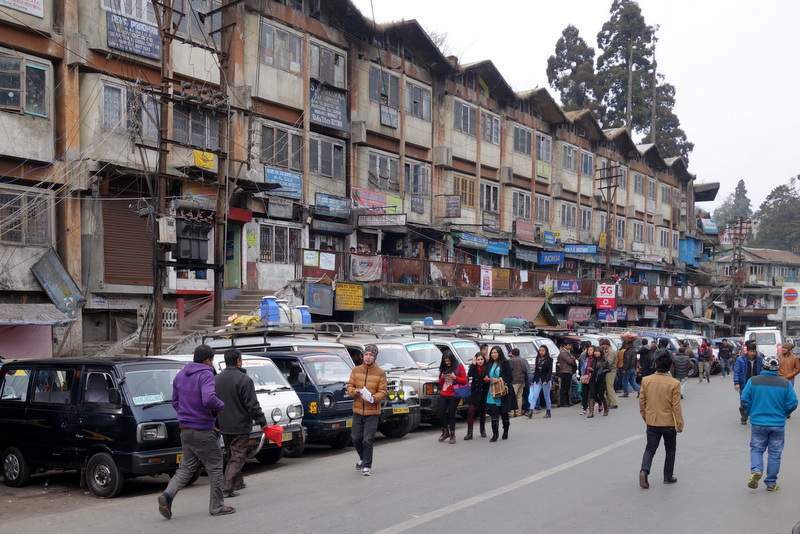 Despite Darjeeling and Kalimpong are the two bigger cities in the area, and the distance is only 57 kilometres, here are no connecting busses! I finally find a proper ticket office way back through some dirty shops and tunnel like constructions. I get seat no five in the next Jeep, departing when the last two seats are sold. They have squeezed an additionally row of seeds into the back, and hare are four persons in each row - and a child more. At last, it is only 57 kilometres. We leave at three, and I look forward to finding a hotel while it is light, and catch up with some work and planning. After one and a a half hour, the driver announces 20 minutes brake. He start washing his Jeep while we are two who get out to have a cup of tea. The remaining ten keep sitting inside the crammed car. 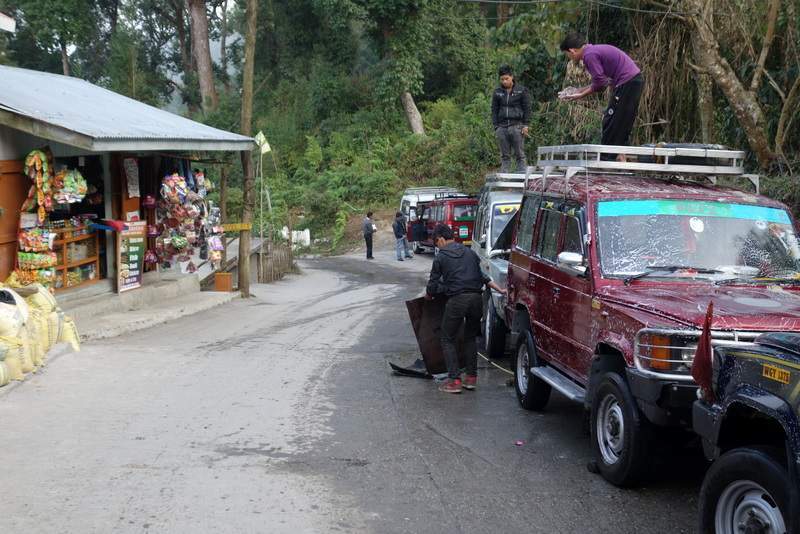 We head on, and a hour after dark, we reach Kalimpong (elev 1250). It was a nice drive through tempered rainforest with overgrown trees, huge tea plantations and a few tiny villages. Crossing a big, blue river; Tista, and doing a lot of turns. One was without a doubt the sharpest corner I've ever taken: 560 degree, I think. Involving a bridge and tunnel. What I don't get is how a 57 kilometre tour can last for three and a half hour! The 120R was that considered rather cheep. Despite is is dark, I find my hotel: Sherpa's Lodge, rather fast. The owner speak a good English, and he have a fantastic knowledge about the area, and is is more than willing to share. I wished there was more like him. He have a map of the area for me, and give me the highlights and the nurseries I want to visit. i head down the street to get some Supper; Rice and Curry. This hotel have no Wi-Fi either, and I better buy some my self. While I wait for my food, I check at a cell-phone shop next door. Sure, he just want to see some ID. He closes at eight, no problem. Well, when I returns half pass seven, the shop is closed like all the others. Slightly annoying, and the last two wasted nights don't really help on my understanding. I get back to the hotel, where the owner supplies me with a bucket of hot water - the usual thing around here. Afterwards, I work for some hours, but the lack of sleep kind of spoils the fun. Problem is, I need the planning for tomorrow, and I guess it will be a real busy day. I freezes quite a lot, despite is is 16C at my room. The 200 photos of the day seems like an endless task. The planning is easier: Here are several monasteries and temples - which I won't see. 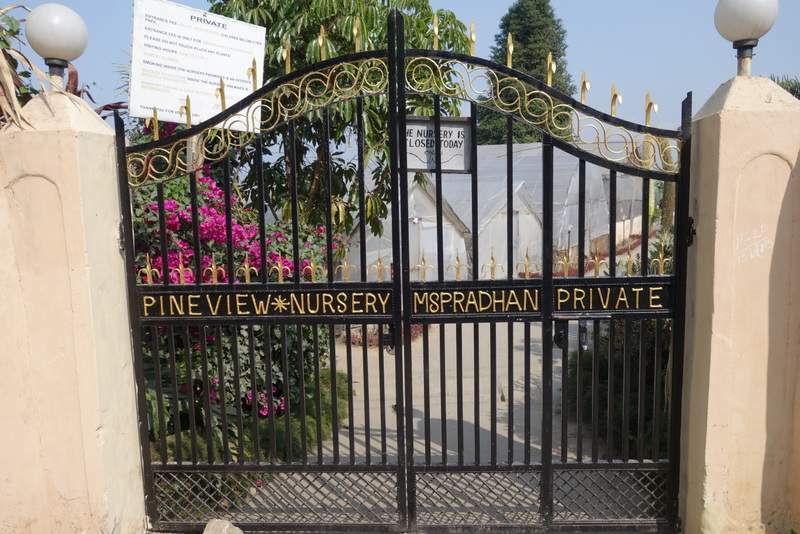 I have an appointment at Himalayan Orchid Exports nursery (one of these days), and I will try to visit Nurseryman's Heaven and Pineview Nursery as well. Here are maybe 30 nurseries, but not all are interesting for me. My host recommended several things like Deylo Hill with an astonishing view, a handmade paper mill, a gumpa and some more, gone for now. The area also have some great walks, but only if you got the time: I don't! To prevent my bag from cracking open again, I do some stitching on it - I think. Bit hard to see black-in-black in next to nothing light. A also hang my laundry to dry, although I doubt it will have any effect. The car remained wet for 30 kilometres after it was washed - and that was driving! In my crammed room with a humidity on 78%, it will be a miracle. In the line of desperate actions, I try to get my visa card to stay in one piece with superglue. I might need it on the trip, and it is living hell to change it for the monthly drawings and especially the Danish Rejsekortet! Meanwhile, the computer do backups on the rather filled 32GB USB sticks. At eleven, I have to throw in the towel: I can't accomplice anything anymore. 30. Despite I am tired as an entire older people's house, I have a hard time sleeping. It is, as mentioned before; cold! Further more, the single blanket I got is thin and way too short and narrow. I try to bend together, but then the back stick out in one side, and the knees in the other. An early start leads to the usual roti and omelette. Then I try to find transport to the recommended viewing point; Deylo Hill. It is just up the road from two of the nurseries, I have planned to see, and early mornings ought to be beat time to experience clear weather. The Jeep drivers are a tough pack to haggle with. Apparently, there are no bus-Jeeps going there, and I have to pay 300R to get there. On the way, I learn my map is so much out of scale. The long way out of town is short, where the stretch from the road-fork I have to return by, is endless! I have hoped for real interesting nature, but it is not that interesting. I end up asking the driver to wait for me, while I check the breathtaking view from Deyla Hill. Then he can drive me to the first nursery. It is yet another misty morning, and despite the area look like a nice park, the view is based on guesses. Ten minutes, and I give up. We drive down and up the other road, and the driver know the nursery. The Orchids Retreat is not the public nursery I had expected. A huge and impressive house with some small tunnels behind. A gardener follow me back the the mansion, and after an interview, the owner grand me permission to a short tour on his premises. It can't be here he make his money! A bit down hill, and I finally find Himalayan Orchid Export. This is truly something else! Through a Scottish dealer, I have been in contact with junior. Due to my lack of contact means, I have not been able to announce my arrival, and he is occupied elsewhere. Instead, I get to meet his farther and owner of this part of their industry. Udai C. Pradhan is a true gentleman and an excellent host. On top of that, he have an incredibly knowledge. We talk over a cup of tea for a long time, then he show me his collection. 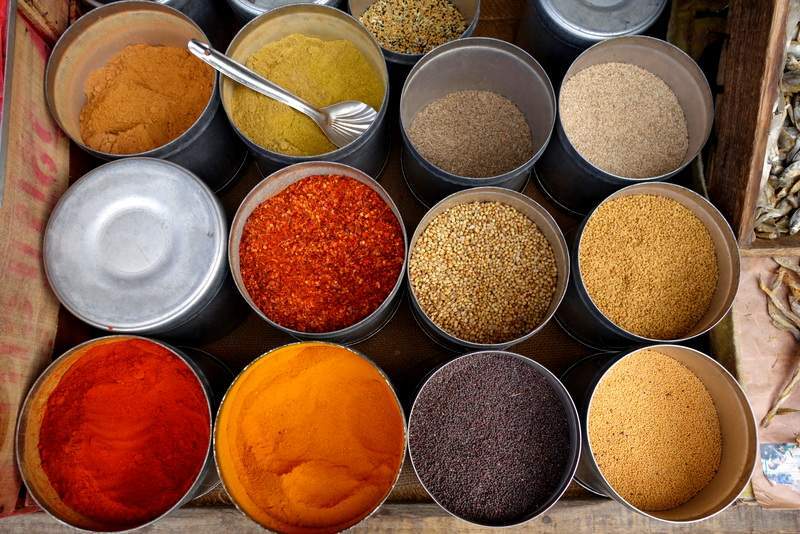 Besides from the plants they have in trade, they have a huge amount ready, when the marked get ready. Again, I can confirm; they give their plants way more light. Here are only 20% shadow, and we are close to equator. 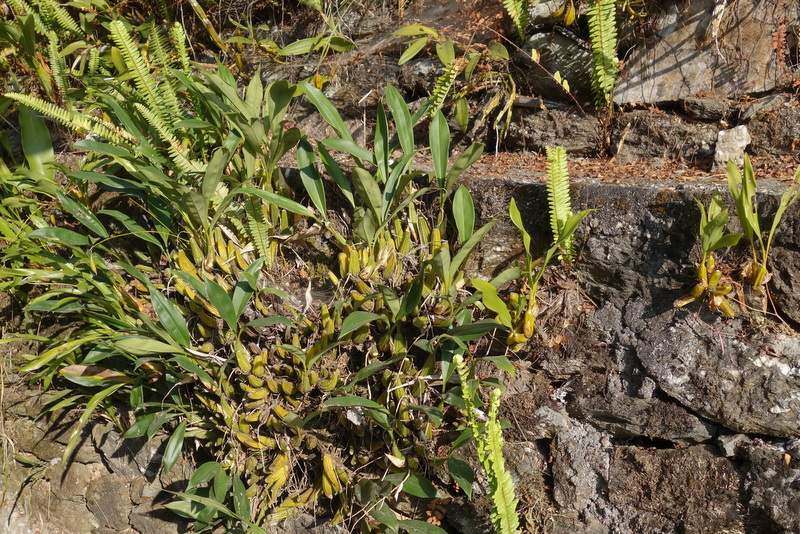 Many terrestrial are grown on a rock-wall, and seem perfect! A real delight to see this, and meet the owner. Considered the price I paid to get here, I walk back to town. 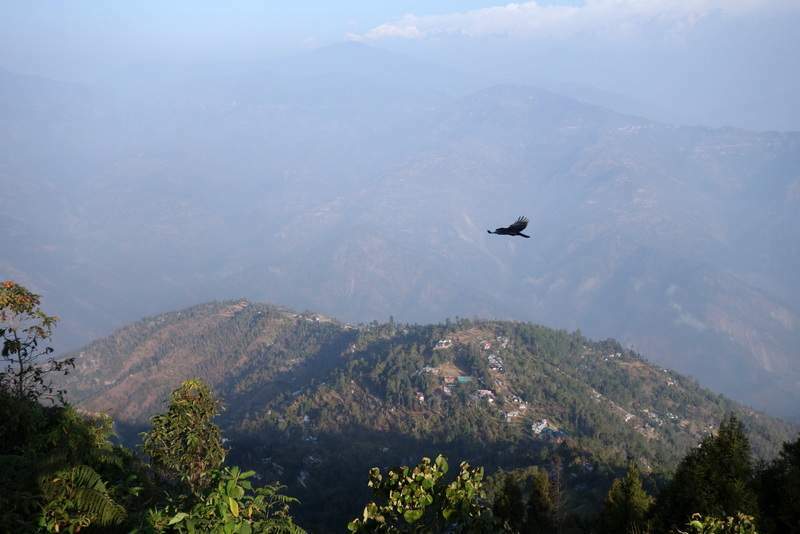 It is only half a hour, and the nature is nice, so are the outskirts of Kalimpong. I end in the 10 Mile market, but walk fast through it for now. On the other side of town, the Nurseryman's Heaven orchid nursery is found up on the steep hillside. 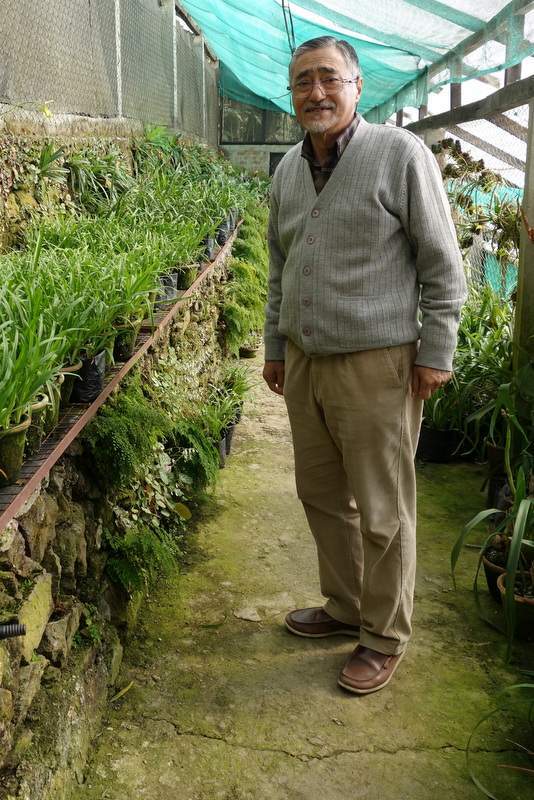 A short talk with the owner, who especially point out an un-described orchid he have found. He offers me one, and it would be great to bring it back, and let Henrik Æ. Petersen describe it - but that is not possible without a ton of papers. A tour around the different tunnels give me an idea of their methods. They use 30% shadow, I think. Then, further out town and up another hill side, to find Pineview Cacti Nursery. It is a long walk, but I manages to find it. I can see some rather huge tunnels from a distance. The impressive gates are closed, and a little sign tell: The nursery is closed today. I am not really lucky these days! And from what I can see through the gate, it would have been so interesting! I have to do the long walk back to town. The huge number of hoses along the road puzzle me. It look like every house has it own for water supply! A bit further down the road, I get that crazy thought confirmed. And they all lying on top of the sidewalk, gutter and whatever are along the road. Many are fizzing or directly running. Back in town, I desperately seek some internet. The huge mobile-company Airtel has the right solution. But; they need passport, copy of passport, photo and current address in India. Considering I'll only be here for 3-5 days more, I can't be bothered. I find a rather fancy hotel-restaurant, who actually have Wi-Fi for hire. I get up to date with upload and emails while I drink two cups of what I thought was tea. Then he ask, if I want a third cup of coffee! It might have been coffee? The internet was a bit expensive, but at least it worked perfect. Down town to find a souvenir and replacement cloth. Somehow, I find my self in two cake shops, eating samples. I go through the 10 Mile Market again, and get some dissent shots. A small Ganesh might make it up for my souvenir of Bengal. At four, I return to my cold room to catch up with work. The planning still bothers me. I can see, the next national park is rather hard to access, and I might have to skip it. Somehow, I lack information for the next park in line. If the transport is a slow as the one from Darjeeling, it will take a day to reach it. Then again, I think it is lowland, and that ought to help. From here, I have a long drive to Siliguri and further on to the Nepali border. It is a circle I do, and in Denmark, I could do it in about 2-3 hours. Here, it is more likely 3-4 days. At seven, I'm ready to revisit the restaurant with internet. Both for dinner, which should be good at this 125 year old restaurant, still in the same family's control. 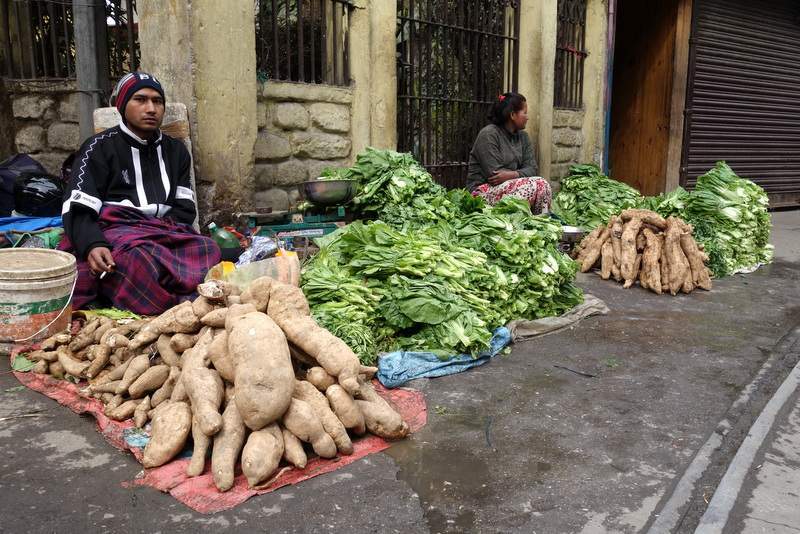 While I'm at it, I upload the Darjeeling - Kalimpong slideshow. The food is fantastic: Boneless chicken in oyster sauce and fried rice with pork. I try desperately to get a name to that epiphytic caudiciform I have seen around here, but I can't come up with a family, and then it seems impossible. here, like everywhere else like in the Jeeps, everyone is complaining about how cold it is, but none closes the doors and windows. I think a fireplace would be the right thing to attract customers! At nine, I better head home: The gate is closed at half pass, and there is no bell. Well, it closed half pass eight, and I have to be a bit clever to enter. The epic journey continues in Diary 2.